Germany’s Luftwaffe was numerically outnumbered as WWII progressed, with the Fatherland and tactical units constantly being bombed and strafed by enemy aircraft. This called for more effective antiaircraft systems than Germany hitherto possessed, which initially were often poorly protected halftracks. New self-propelled AA types were put into service, including the Flakpanzer IV. A new type was also planned – the Flakpanzer V “Coelian” from Rheinmetall. The Coelian featured a special armored turret that would protect the crew inside the vehicle. It used a standard Panther tank chassis upon which were mounted twin 3.7cm FlaK 43 cannons. 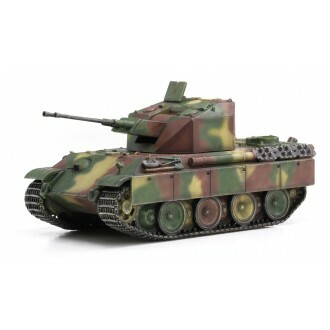 Ultimate Armor series is a new line-up of Dragon Armor, featuring unusual and rare vehicle types such as the first subject Flakpanzer V "Coelian" presented here. Those unique items will cater to the demands of discerning collectors. Many such rare fighting-vehicles will come up. Stay tuned! 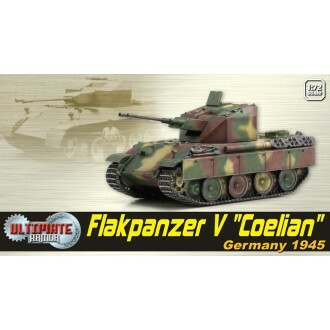 What sets this Dragon Armor item apart from the previous release of the Flakpanzer V “Coelian” is its painting. Instead of an overall coat of sand yellow paint, this 1/72 scale model is finished in a late-war three-color scheme. This fine model features the correct dual antiaircraft guns mounted based on a Panther chassis, and the fully enclosed turret is a new molding. It carefully replicates the prototypical turret structure that never actually got to see combat. This turret and associated gun system are made true to scale. While this system never had the requisite time to get off the drawing board, Dragon’s engineers are proud to bring this second exciting model to collectors’ display cabinets!